Growth Energy recently unveiled a national ad campaign to tell “the truth about ethanol” and the Renewable Fuel Standard (RFS)—the federal mandate that requires oil refiners to blend ethanol into gasoline. But the ethanol lobby has a curious definition of “truth,” as many of their claims are incomplete, misleading, or outright false. When we see LeBron James wearing Nikes, Phil Mickelson swinging Callaway golf clubs, or people in the TV show The Office using Apple products, we should not be surprised because these are all paid product placement. The fact that NASCAR uses ethanol does not say much if anything about ethanol, other than the fact that NASCAR is paid to use it. Lastly, it is disingenuous for Growth Energy to include the greenhouse gas emissions of cellulosic ethanol in its graphic because only miniscule amounts of cellulosic ethanol are produced. Currently, the U.S. consumes more than 133,000,000,000 gallons of motor gasoline a year. In contrast, in 2011, zero gallons of cellulosic ethanol were sold commercially; last year only 20,069 gallons of cellulosic ethanol were sold commercially; and so far this year only 129,731 gallons have been sold. If ethanol improves the economy, as Growth Energy argues, then there is no reason for the Renewable Fuel Standard to exist. If that is Growth Energy’s argument, we agree. The problem with the Renewable Fuel Standard is that as a mandate, its purpose is to force people to use something they would not otherwise use, or to use it in higher quantities than otherwise. By forcing people to use more ethanol that they would otherwise use, the Renewable Fuel Standard harms the economy, because “the economy” is simply a way for us to trade with each other and improve our situations through cooperation. If someone forces vegetarians to buy hamburgers, or non-smokers to buy cigarettes, that might look like “economic growth” and “job creation” but it doesn’t actually make Americans better off. By the same token, if the government forces people to use ethanol, that’s not genuine prosperity. Growth Energy’s chart showing declining net oil imports is accurate, but it fails to state the biggest reason for the reduction in oil imports—increasing domestic oil production, not ethanol. Net oil imports are falling because U.S. oil consumption is holding steady, domestic fuel production is increasing, and the U.S. is exporting a greater amount of petroleum products. U.S. liquid fuels production rose 39 percent from 2005 to 2012, according to data from the Energy Information Administration (EIA). Biofuels accounted for 32 percent of the increase, while petroleum contributed about 68 percent. Because of increased domestic production and fairly flat demand, the United States is exporting petroleum. U.S. petroleum exports almost tripled between 2005 and 2012. Growth Energy’s chart is based on net imports, which are gross imports minus exports. Increased domestic petroleum production, not ethanol production, is the biggest force behind America’s reduction in imports. Earlier in the year, EIA projected that monthly domestic oil production was on track to surpass net imports for the first time since 1995. EIA attributes this change primarily to “rising domestic crude oil production, particularly from shale and other tight rock formations in North Dakota and Texas.” America is indeed weaning itself off of foreign oil, but the ethanol industry does not deserve nearly as much credit as they claim. Growth Energy writes, “For every gallon of renewable fuels that is blended into gasoline, it’s one less gallon of gasoline the oil industry can sell…It’s really quite simple. It’s all about money.” Growth Energy knows this statement is incorrect. They are correct, this is about money—that’s not the issue. The issue is whether “for every gallon of renewable fuel that is blended into gasoline, it’s one less gallon the oil industry can sell.” This is inaccurate because a gallon of ethanol is not the same as a gallon of gasoline. A gallon of ethanol contains 33 percent less energy than a gallon of gasoline and therefore it takes more gallons of ethanol to travel the same distance as using gasoline. The argument about money applies equally to the ethanol industry. Of course oil companies do not want to be forced to sell their competitors’ products, in the same way Honda would not want to be forced to sell a certain percentage of Chryslers. But this is exactly what the Renewable Fuel Standard does. Growth Energy and ethanol companies support the Renewable Fuel Standard because it forces oil companies to sell ethanol. Growth Energy, Cargill, ADM and other major ethanol producers could start their own gas stations and sell as much ethanol as people would like to buy, but that is not what they want. By supporting the Renewable Fuel Standard, Growth Energy wants to force people to sell Growth Energy’s products. This chart is misleading for several reasons. The most obvious is that the chart conveniently excludes most of the Obama administration, when subsidies for green energy technologies skyrocketed. For example, according to the Energy Information Administration, between fiscal year 2007 and fiscal year 2010, subsidies for renewable energy almost tripled. In fiscal year 2010, biofuels received 3.5 times the subsidy level that petroleum liquids and natural gas received outside the electricity generation sector. The chart correctly notes that the Volumetric Ethanol Excise Tax Credit (VEETC), which paid the ethanol industry to produce ethanol, expired at the end of 2011. According to the White House’s budget, in 2011, the VEETC was worth $6.5 billion and in 2012 it was worth $3.6 billion. That’s nearly twice as much money as the oil and gas tax credits were worth over 91 years. Another problem is the way oil subsidies are calculated. According to the report the chart is based upon, the only “subsidies” for oil and natural gas companies were “the expensing of intangible drilling costs and the excess of percentage over cost depletion allowance.” These tax deductions are akin to those that businesses receive for depreciation (percentage depletion allowance) and research and development (expensing of intangible drilling costs). All businesses receive the domestic manufacturing tax deduction, but the oil and gas industry can only claim a 6 percent deduction of its profits, while all other manufacturers can deduct 9 percent. Large oil companies, however, are specifically excluded from some of the incentives that the small independent oil and gas companies receive, as IER explains in a recent analysis. 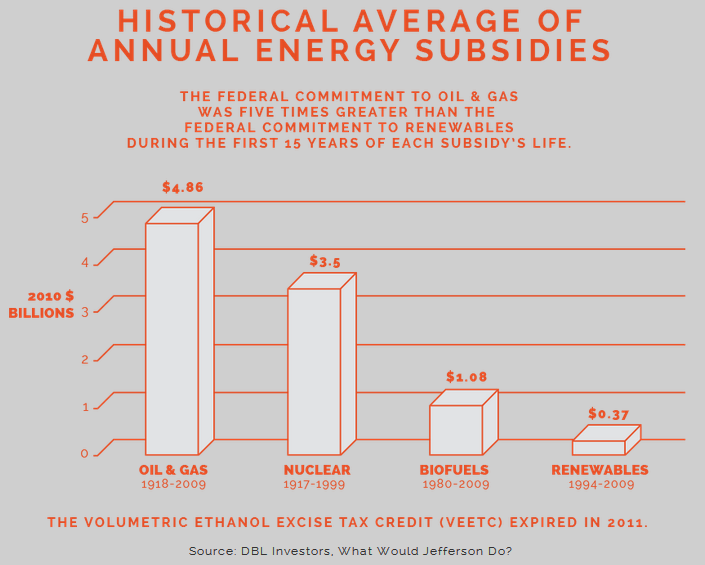 So-called subsidies for oil are much different than subsidies for ethanol. The VEETC, on the other hand, provided 45 cents for every gallon of ethanol blended with gasoline. Though the ethanol tax credit expired, the federal government continues to offer tax credits to biodiesel producers. Lastly, ethanol has been used in internal combustion engines for nearly 190 years—ever since Samuel Morely experimented with ethanol mixed with turpentine. Ethanol is not a “new fuel” that needs subsidies to compete. But the problem with ethanol is not isolated to just automobiles. Ethanol poses even more problems for machines with small engines. As AAA explains, gasoline blended with even as little as 10 percent ethanol can accelerate engine failure in boats, motorcycles, lawnmowers, and other small engines. As a result, some boaters are turning to ethanol-free gasoline. A gas station owner in North Carolina, for example, says many customers are willing to travel across the county for gasoline that they know won’t harm their boats. The National Marine Manufacturers Association (NMMA), the trade group for the recreational boating industry, also opposes gasoline blended with more than 10 percent ethanol. While it is true that on a per gallon basis, ethanol is less expensive than pure gasoline, that is not the correct measure. The real unit of comparison is not the cost per gallon, but the cost per unit of energy. Because ethanol contains about 33 percent less energy than gasoline, as ethanol content increases, fuel economy decreases. AAA’s Daily Fuel Gauge Report reflects this scientific fact; the BTU-adjusted price of E85, ethanol that contains up to 85 percent ethanol, is consistently higher than conventional gasoline. A year ago, regular gasoline cost about 70 cents less than E85 on a miles-per-gallon basis. Even with a record corn harvest driving down corn prices this year, E85 still costs about 20 cents more than conventional gasoline. As for the study Growth Energy references, the Iowa State study claiming that ethanol production has suppressed the growth in gasoline prices is very misleading. It takes for granted the current refinery capacity and other infrastructure that industry uses to deliver gasoline to motorists, without realizing that federal policies over the years have distorted the development of these markets. Ethanol only survives in the market place at its current levels because it is propped up by artificial mandates and preferential tax treatment. The regression analysis of the Iowa study doesn’t accurately capture the timeline that would have occurred had the free market been allowed to operate. Of course, a sudden disappearance of all ethanol would cause a bigger price spike in the Midwest than in the East Coast. That’s because the artificial federal support has displaced the development of oil-based gasoline delivery in the Midwest more than in other regions. The fact remains that ethanol (at its current market share) is very inefficient. Taxpayers and consumers would be richer if the government dropped its support programs for it. For a more complete explanation, see this analysis. Even if the Wisconsin and Iowa State study is correct that ethanol decreased gasoline prices in 2011, blending increasing amounts of ethanol threatens to increase, not decrease, gas prices in the near future. A recent study by the Energy Policy Research Foundation, Inc (EPRINC) finds that E10 prices could spike as much as 50 cents to $1.00 per gallon in 2014. EPRINC attributes the increase to “constraints in cost effective opportunities to blend larger volumes of renewable fuels into the U.S. gasoline pool,” otherwise known as the blend wall. When the blend wall is hit, refiners must purchase Renewable Identification Number (RIN) credits, which allows them to not meet their required biofuel quotas. The value of RINs has skyrocketed by 2300 percent during the past year due to the approaching blend wall. The cost of the RINs is passed onto the distributor and then to the customer. Another study by NERA Economic Consulting finds that by 2015 the federal ethanol mandate could raise diesel costs by 300 percent, gasoline prices by 30 percent, and reduce take-home pay for American workers by $580 billion. As we get closer to the blend wall, the impact of the Renewable Fuel Standard will become more and more severe. The ethanol tax credit may have expired, but the ethanol industry continues to enjoy what is arguably an even more attractive subsidy: the Renewable Fuel Standard (RFS). Passed in 2005 and expanded in 2007, the RFS requires oil refiners to blend increasing amounts of ethanol and other biofuels into the nation’s transportation fuel supply, with the goal of blending 36 billion gallons by 2022. By forcing refiners to purchase ethanol regardless of whether it makes economic sense, the RFS creates artificial demand for ethanol. Tax credits, on the other hand, make production more profitable, but don’t compel people to purchase the products produced. In other words, the RFS gives ethanol producers a much more valuable gift than tax credits—it gives them repeat customers. Further, the U.S. oil and gas industry does not receive the federal subsidies that Growth Energy cites in the above graphic. The International Energy Agency (IEA) annually estimates global fossil-fuel consumption subsidies that measure what developing countries spend to provide below market cost fuel to their citizens. The IEA is a creation of the Organization for Economic Cooperation and Development (OECD), which represents the developed nations of the world. In 2011, IEA found fossil fuel consumption subsidies total $523 billion, 27 percent higher than the 2010 total of $412 billion. This increase is almost entirely due to the increase in international energy prices, particularly oil prices. Oil subsidies make up over half of the total fossil fuel consumption subsidies, while electricity makes up 25 percent, natural gas 20 percent and coal less than 1 percent. Developing countries artificially lower energy prices to their citizens, paying the difference from their government resources. Such welfare transfers are akin to the U.S.’s Low Income Home Energy Assistance Program (LIHEAP), and are different from subsidies in the name of commercializing uneconomic energy sources such as on-grid wind or solar. The United States and other developed countries offer support to energy production in the form of tax credits, loan guarantees or use mandates, which are not included in IEA’s fossil fuel consumption subsidy calculations since they are directed towards production rather than consumption of the fuel. For a greater discussion, click here. Millions of gallons of ethanol would be produced and used every year without the Renewable Fuel Standard since refiners would use it as an oxygenate. The problem is not ethanol per se, the problem is the Renewable Fuel Standard, which artificially increases the amount of ethanol required. The Renewable Fuel Standard increases gas and food prices, decreases fuel economy, and damages small engines. As such, it is time for Congress to repeal the mandate. Analytical Perspectives: Fiscal Year 2013 Budget of the United States, http://www.whitehouse.gov/sites/default/files/omb/budget/fy2013/assets/spec.pdf, p. 253 footnote 2. Nancy Pfund & Ben Healey, What Would Jefferson Do, Sept. 2011, http://www.dblinvestors.com/documents/What-Would-Jefferson-Do-Final-Version.pdf p. 20.